Pedestrian crossing control helps traffic engineers, urban planners and road designers meet the challenge of safely accommodating pedestrians while also serving the needs of other road users. This webinar will lead participants through the updated content in TAC’s Pedestrian Crossing Control Guide, 3rd Edition, which features the introduction of two new treatments: enhanced crosswalks with side-mounted signs (GM+), and rectangular rapid flashing beacons (RRFBs). 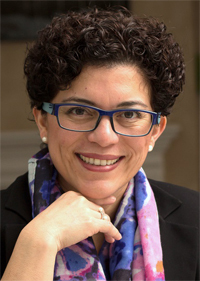 Dr. Jeannette Montufar is Founding Partner and CEO of MORR Transportation Consulting, and Co-Founder of TRAINFO Corp. She is a registered professional engineer in Manitoba and Alberta, and a Certified Professional Traffic Operations Engineer. Dr. Montufar has over 20 years of experience working in Canada, the U.S., and Latin America. She was professor in Civil Engineering at the University of Manitoba for 13 years, during which time she published nearly 200 technical papers and reports on road safety, freight systems, vulnerable road users, traffic engineering, and other topics. Dr. Montufar has been an active member of various professional organizations for over 20 years including TAC, ITE, TRB and others. She is a member of TAC’s Traffic Operations and Management Standing Committee and Road Safety Standing Committee. Dr. Montufar has received over 15 local, national, and international awards for her contributions to transportation engineering, as well as for her community service. In 2016, Dr. Montufar was inducted as Fellow of the Canadian Academy of Engineering for her contributions to the engineering profession. 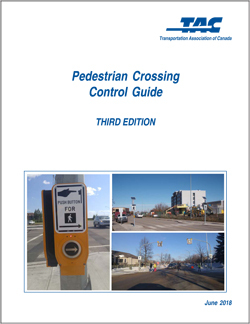 Those registering for the webinar will receive a 15% discount when they purchase one copy of the Pedestrian Crossing Control Guide (2018) in print (PTM-PCCG18-E) or e-book (PTM-PCCG18-E-EBK) formats. A promo code will be provided as part of the webinar confirmation email. Offer valid until 2018-11-30.